The appropriate detailed design of drainage can significantly impact on the quality and safety of cycling facilities. Under the 1993 Roads Act (Section 13, Part 2), Local Authorities have an obligation to maintain public roads. The maintenance of cycle ways and cycle tracks falls within this remit. Bicycle braking systems and tyres are not as effective in the wet – it is harder to stop, and there is more risk of skidding in the rain. The drainage of a cycle route must aim to remove surface water quickly and efficiently, in a manner that is cycle-friendly, and consistent with sustainable drainage principles. 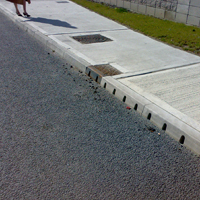 Continuous side entry drainage kerbs are generally preferred so that the entire road surface is available for cycling and not interrupted by gullies. This section provides advice in relation to the provision of effective drainage, and commentary on how certain detail design can either improve or hinder drainage and cycling. On-road cycle lanes and mixed use streets are frequently the preferred retro-fit option given the limited changes to existing infrastructure, including drainage, that are required. However, while the design of drainage is an important consideration, drainage convenience is never the primary or sole rationale for determining which facility should be chosen. The various types of cycle facility and their appropriateness are dealt with in Link Types and Integration or Segregation. The cycle route surface should be as smooth as possible to ensure efficient surface water run-off. A rough texture will provide for increased grip and reduced wheel spray compared to a smooth texture. On cycle surfaces, there is no requirement for significant macro-texture. Therefore the wearing course should consist primarily of smaller aggregates, e.g. 10mm or less. While high-friction (anti-skid) surfacing, in a range of colours, is often used to provide grip as well as delineation, the cost can be excessive, and its use should be limited to high-risk locations. Drainage gullies, channels and manhole covers can present hazards to cyclists and should be located away from travelling surface used by cyclists. This is particularly important on bends and sharp curves as wet ironmongery is quite likely to cause cyclists to skid, slip or fall off. Gullies with slots running parallel to bicycle wheels are also a serious hazard to cyclists. Offline positioning for manholes etc. If ironmongery cannot be located offline, it must be finished flush (typically +/-5mm) and recessed manhole covers should be considered to avoid slippery metal surfaces. If gullies cannot be located offline, their slots must be at right angles to the cycling direction. Drain to both sides. This might be used on cycleways and on certain segregated cycle tracks. Drain to one side only. This is applicable to on-road cycle facilities and certain cycle tracks. On bends, a cycle track should always drain towards the shorter radius. A right hand bend should drain to the right, and left hand bend should drain to the left. If as track were to drain the other way, there would be a negative camber, increasing the risk of skidding. The extra thickness of road markings and coloured surfacing can block cross-flow and cause ponding. Detailed design should ensure that the finished levels of all surfaces are flush. This may require milling of existing surfaces to achieve a smooth joint of the new material with the adjoining surface. Gaps may need to be provided in continuous line markings (mandatory cycle lanes and bus lanes) to ensure effective cross-flow. 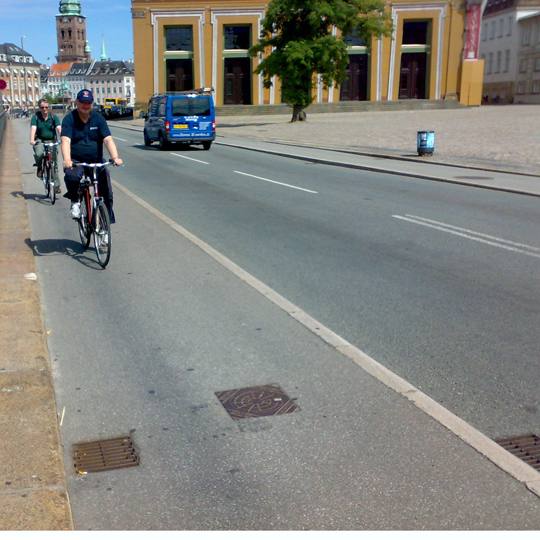 On adjacent cycle tracks, cross-fall away from the main carriageway is more comfortable for cyclists. However, this requires an independent gully or channel system. 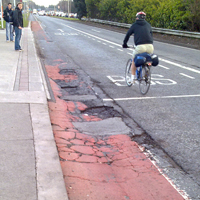 In such instances, ensure that the cycle track gully spacings match the main road gully locations to reduce pipework. 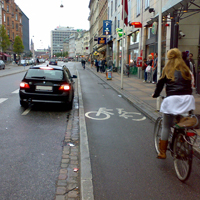 The provision of footpaths and cycle facilities can generate as much run-off as a standard 7.3 metre wide carriageway. This must be taken into account in the design of the overall drainage network. For new roads, this can be managed using sustainable drainage solutions such as permeable road surfaces. 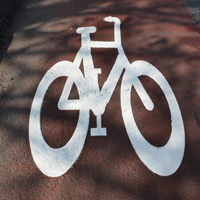 Unbound surfaces are appropriate for certain cycle routes such as cycleways and cycle trails. 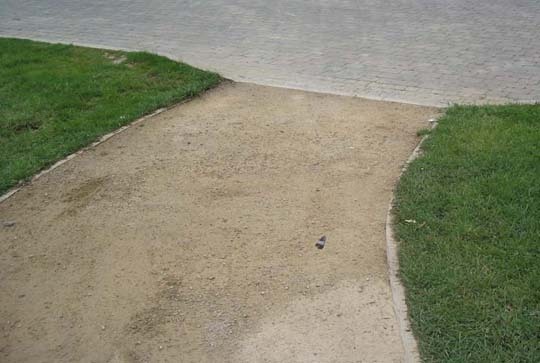 Where an unbound surface is used, it is important that the cycle track is constructed so that surface water is shed to the sides, notwithstanding the fact that the surface is permeable. This is to prevent the sub-surface from becoming saturated. Unbound surfaces are normally formed in a well-graded granular material such as CL 804 Sub Base material (sometimes referred to as dry bound macadam) or 20mm single sized stone pea gravel.